Great views from panorama windows in lounge and master bedroom; master bedroom, en-suite and dressing room hi spec; kitchen great size and all the facilities we needed; massive basement with laundry; well laid out garden, patio and sunbathing space with plenty of room; outdoor bar was a great feature, as was BBQ and jacuzzi. Pool was good size for relaxing. Very quiet area, quality feel about the villa without being pretentious. 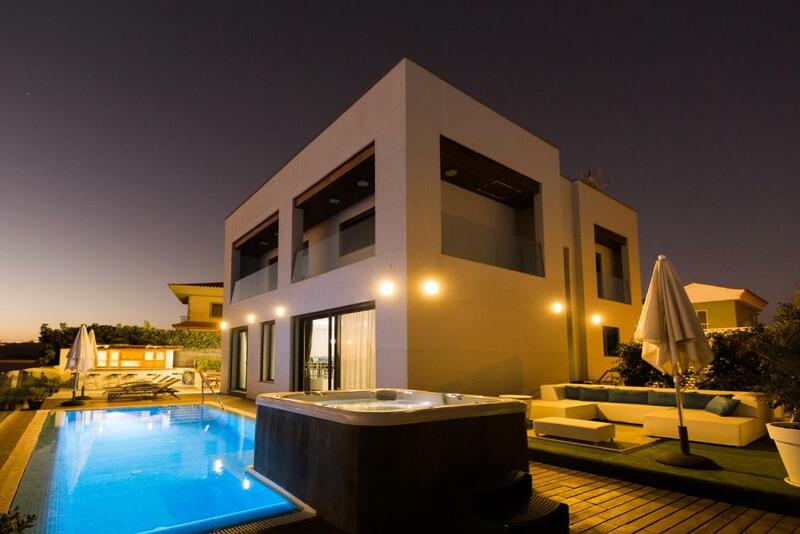 This villa was outstanding in every way. We thoroughly enjoyed our stay. We definitely hope to go again next year! It was perfect for our family holiday. 6 adults and 2 young children. The setting is fabulous looking out to sea. The house is fabulous, very modern and spacious and well equipped. The house was like paradise. Great view, the garden was big and green. We had a wonderful 7 days. Iso huvila, kaunis piha palmuineen. Hieno oma uima-allas ja poreallas. Mukavat sängyt. Hyvät keittiövälineet. Iso ruokakauppa Mercadona 500 metrin päässä. Pihalta hienot maisemat merelle ja palmupuiselle golfkentälle. Huvila oli vielä parempi kuin miltä kuvissa näyttää.Todella mukava ja renttouttava loma. La amabilidad del anfitrión y toda la villa en general. Absolutamente todo, la casa es realmente impresionante como se muestra en las fotos, las vistas de ensueño y Aurelio el propietario muy atento en todo momento a nuestras necesidades. Lock in a great price for Ananda Vistas Meloneras – rated 9.7 by recent guests! Featuring an outdoor pool and sea views, Ananda Vistas Meloneras is located in Meloneras. Guests might enjoy the free WiFi. This villa includes a living room and a flat-screen TV, an equipped kitchen with a dining area, and a bathroom with a hot tub and a washing machine. At the villa guests are welcome to use a hot tub. A garden, grill and a terrace are available at Ananda Vistas Meloneras. Costa Meloneras is 1.2 miles from the accommodation. The nearest airport is Gran Canaria Airport, 22 miles from Ananda Vistas Meloneras. This property is also rated for the best value in Meloneras! Guests are getting more for their money when compared to other properties in this city. When would you like to stay at Ananda Vistas Meloneras? 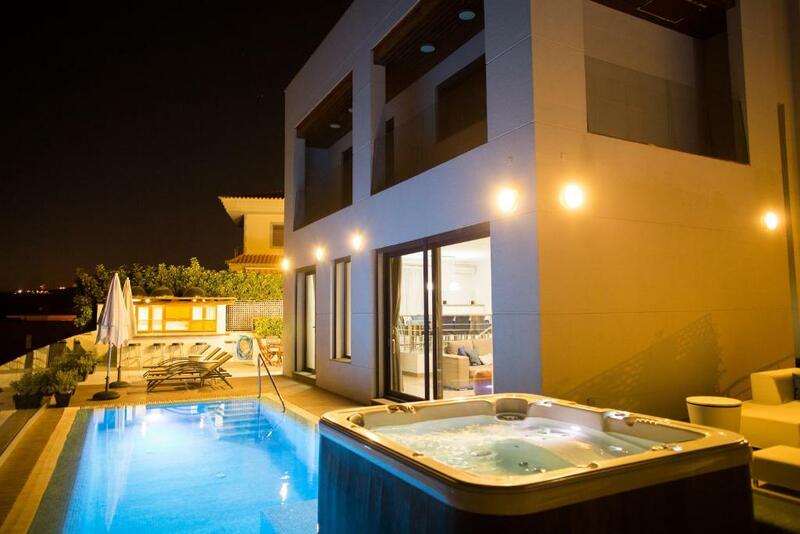 This villa features a balcony, tumble dryer and washing machine. 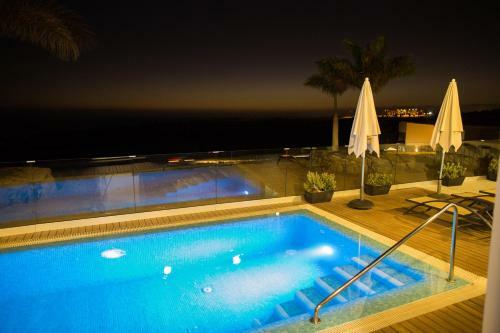 We would like to introduce you to an amazing selection of properties located in either strategic or idyllic areas of Gran Canaria, fondly run and managed DIRECTLY by the OWNERS. House Rules Ananda Vistas Meloneras takes special requests – add in the next step! Ananda Vistas Meloneras accepts these cards and reserves the right to temporarily hold an amount prior to arrival. Please inform Ananda Vistas Meloneras of your expected arrival time in advance. You can use the Special Requests box when booking, or contact the property directly using the contact details in your confirmation.